Mortgage is used by purchasers or existing property owners to raise funds for whatever purpose they intend to use it. The mortgage loan is secured on the borrower’s property. The borrowers can be individuals who put their homes on mortgage or businesses that put their business properties on mortgage. The lenders are the banks, financial institutions, business society, or credit unions. Mortgage loans need a collateral to secure the deal. 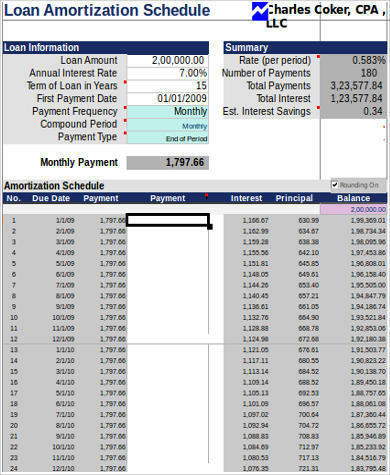 It is essential that you use a mortgage amortization schedule to keep track of your payments to avoid losing the property you put in collateral. 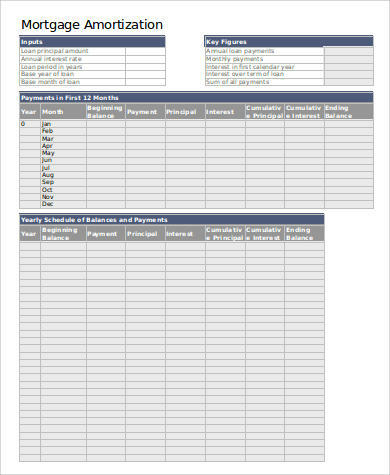 Below are downloadable Sample Schedules that can help you with it. Fixed Rate Mortgage – The interest rate of the mortgage stays the same or is fixed for a number of years. A fixed rate funding is expensive and hard to obtain. Variable Rate Mortgage – The interest rates changes or fluctuates over time based on an index. Part of the interest rate risk is transferred from the lender to the borrower, that is why it is widely used. Standard Variable Rate Mortgage (SVR) – The borrower has freedom in this type of mortgage as they can leave or overpay it at any time. The downside is that the rates change anytime during the loan. Discount Mortgage – It offers a discount from the lender’s standard variable rate. Typically offered over certain period of time or for a span of two to three years. 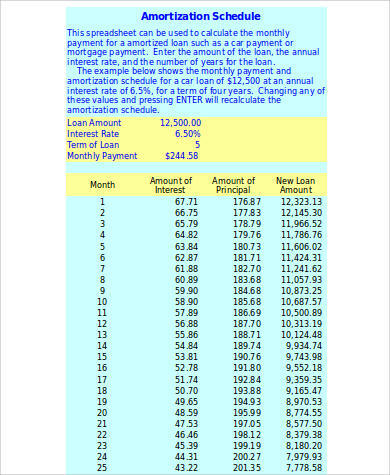 In this type of mortgage, the starting rates are cheap and this makes the monthly payments lower. The disadvantage of this plan is that the lender can raise the SVR anytime. Tracker Mortgage – This is a type of variable rate mortgage where the loan’s interest rate is periodically adjusted based on a certain index. Capped Rate Mortgage – The rate of the mortgage can’t rise beyond a certain level. Offset Mortgage – By linking your savings to your mortgage, you can reduce your monthly payments. 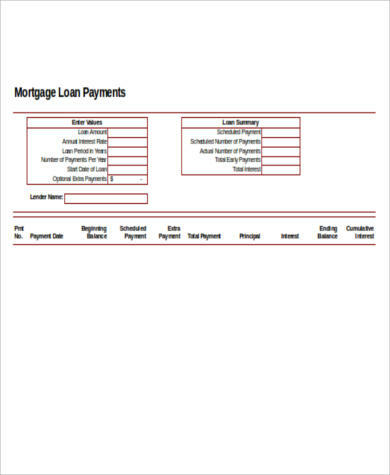 We also have these helpful tools namely the Amortization Schedule Calculator Samples, Amortization Table Excel Samples, and Loan Amortization Calculator Templates to get you going with your amortization needs. It is the process that a lender uses to determine if the borrower is capable of paying the mortgage. This process has certain parameters. A mortgage underwriter analyzes the borrower’s credit worthiness. The risks and terms that underwriters mostly consider fall under what is called the three Cs of underwriting. They are credit, capacity, and collateral. If the borrower is credit-worthy, then the mortgage loan is approved, otherwise it is denied. Mortgages are secured with a collateral, which is commonly a house or a property. You need to keep up with your repayments to avoid losing your home. The lender has the right to foreclose or repossess the property on collateral if payments are not made on your mortgage. This aspect of mortgage loans makes it different from the other types of amortized loans. 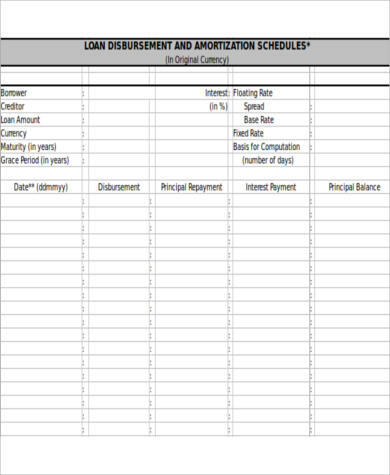 Keeping track of your mortgage amortization schedule is very important to avoid foreclosures or repossession of the property you used to secure the loan. 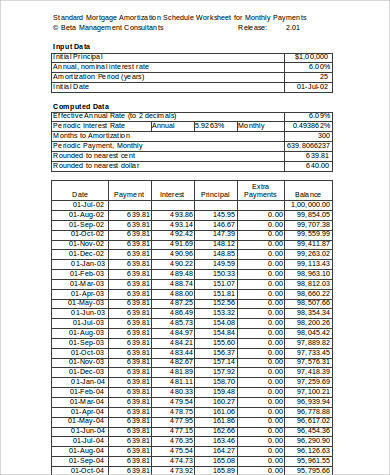 This is the reason why you need to download our mortgage amortization schedule in Excel files and our Excel Amortization Schedule Samples. You will never miss a payment schedule ever. What are you waiting for? Download now!